Search: Type a keyword in the Search box in the center of the page and then click the Search Themes button. A new page opens, displaying themes related to the keyword you searched for. Featured Themes: These themes are listed in the center of the themes directory, randomly. 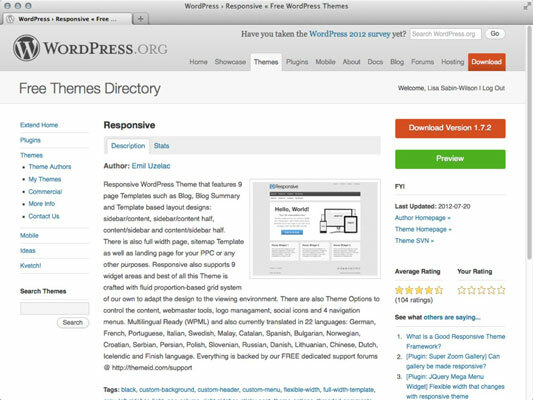 WordPress changes the featured themes listing regularly. Most Popular: These themes have been downloaded most often. Newest Themes: These themes are the latest to be added to the directory. Recently Updated: These themes have been updated most recently by their designers. Download: Click this button to download the theme to your computer. Preview: Click this button to open a new window that shows what the theme looks like in a live blog. Click the Download button on the theme page. The theme files show up on your computer as a compressed .zip file. Use your favorite decompression program to unpack the files to your own computer. 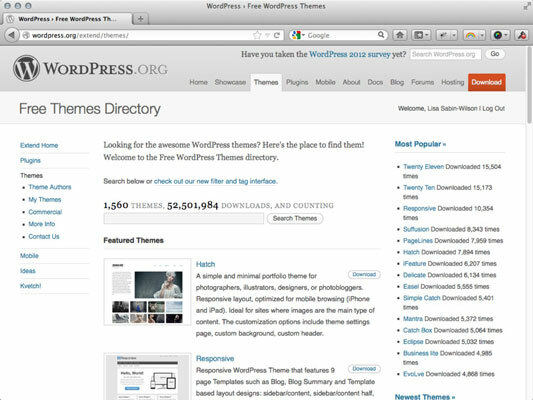 You find the /wp-content/themes/ folder in the WordPress installation directory on your web server.